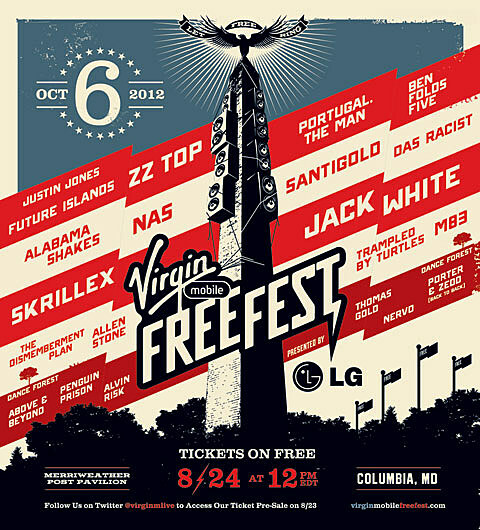 The Virgin Mobile FreeFest returns to Merriweather Post Pavilion in Columbia, MD on October 6 with a lineup that includes Jack White, Skrillex, M83, Nas, ZZ Top, Santigold, Alabama Shakes, Ben Folds Five, The Dismemberment Plan, Allen Stone, Trampled by Turtles, Portugal. The Man, Das Racist, Future Islands and Justin Jones. There is also a “Dance Forest” that will feature Above & Beyond, Porter & Zedd (Back to Back), Thomas Gold, Nervo, Alvin Risk and Penguin Prison, with others to be announced. As the name of the show implies tickets to the FreeFest are free and will be available via ticketfly.com on Friday, August 24 at noon. A presale on August 23 will be announced via their Twitter. There are also some not-free “freemium” packages to buy that include early admission to the festival grounds, a donation to charity and other incentives. Details on that are here. Speaking of The Dismemberment Plan, the indie rock vets began playing shows again in 2011 and at their Baltimore show on Friday (8/10), they played multiple new songs! Hopefully this means we’ll be getting a new D-Plan album (it’d be the first since 2001’s Change). Check out videos of the new songs played at the Baltimore show below.